If you're in the area . 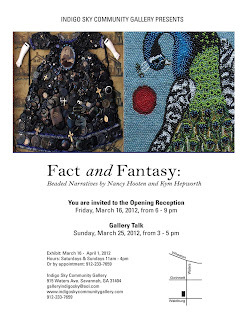 . . stop by Indigo Sky Community Gallery on Friday, March 16th for the opening reception of Fact and Fantasy: Beaded Narratives by Nancy Hooten and Kym Hepworth (6-9 pm). Jerome Meadows is the Owner and Gallery Director of Indigo Sky Community Gallery and Tania Sammons, curator of the Owens-Thomas House and Decorative Arts at the Telfair Museum of Art, is the guest curator of the exhibit. The show runs from March 16 - April 1, 2012. Many, many, many thanks to Tania Sammons for making this happen! and thank you Robin Miller!